- Green color: Green Thai balm with green cap (Green Balm) Wang Prom. Green balm soothes muscle aches and sprains, helps to relieve inflammation from insect bites and to get rid of itchiness, reduce pain and fatigue. Green balm essential muscle aches and joint pains. Immediately after applying Thai green balm penetrates the tissues and gently warms them from the inside. Contributes to the rapid disappearance of bruising, and prevents new ones. Relieves muscle spasms and tension, helps with hydrose, sprains. Relieves itching from insect bites and soothes the skin after long stay under the sun. Green Thai balm is a loyal friend and helper of people engaged in active sports and other activities with a high risk of injuries. 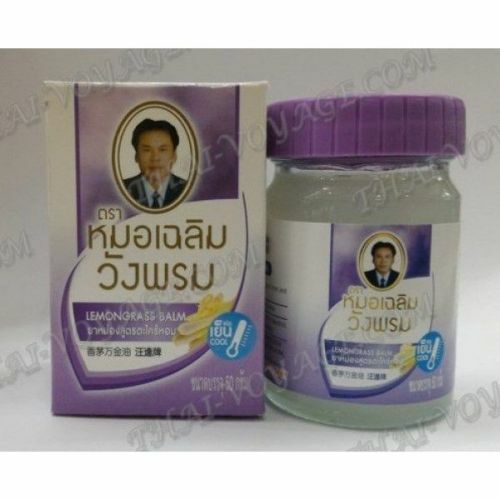 Ingredients: Petroleum Jelly 45%; Barleria Lupulina 24%; Paraffine 15%; Menthol 8%; Pogostemon Caslin 5%; Camphor 3%. - Yellow color: a Yellow balm with the yellow cover (Yellow Balm) Wang Prom. Yellow balm alleviates pain in joints and muscles, relieves fatigue. 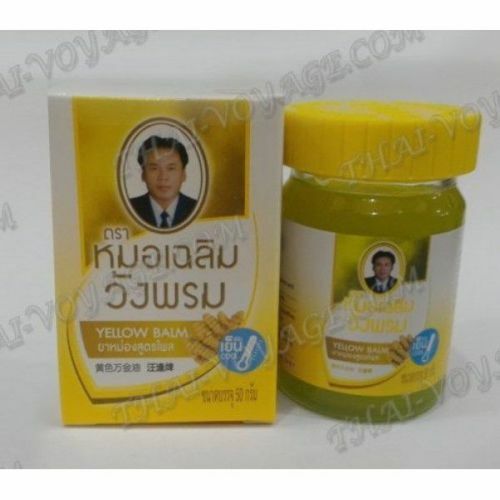 Yellow Thai balm is used in massage and to relieve muscle pain. Balm also helps with headaches and colds. Enough apply the balm on your temples, neck, occipital bone and the wings of the nose, then massage a few minutes massage. Thai yellow balm stimulates blood flow and warms. Maybe a slight burning sensation at the site of application is normal. Ingredients: Zingiber Cassumunar 42%; Menthol 25%; Paraffine 14%; Petroleum Jelly For 11%; Pogostemon Caslin 4%; Camphor 4%. - Color violet: a White balm with the violet lid (Lemongrass Balm) Wang Prom. White balm with lemongrass reduces swelling in rhinitis and insect bites. Repels mosquitoes and other insects. Lemongrass – antiseptic, has strong anti-inflammatory and disinfectant properties, refreshes, tones, treats diseases of the respiratory tract, muscular aches and pains, helps with dizziness, weakness, nausea, depression, fatigue, stimulates blood circulation, metabolism, provides lymphatic drainage, heals skin diseases, acne, cellulite. Ingredients: Cymbopogon Citratus 57; Paraffine 17%; Menthol 9%; Petroleum Jelly 8%; Pogostemon Caslin 5%; Camphor 4%. - Blue color: Blue balm with blue cap (Blue rose) Wang Prom. Blue balm reduces the symptoms of cold and dizziness. Anti-inflammatory and analgesic balm helps with varicose veins, pain in muscles and joints, bronchitis, coughs, colds and runny noses, nasal congestion when General tiredness and insomnia. It is necessary to spread the chest for colds or sniff to facilitate nasal breathing. Ingredients: Syzygium Aromaticum 50%; Menthol 16%; Clitoria Ternatea 10%; Petroleum Jelly 10%; Pogostemon Caslin 8%; Camphor 6%. - Color orange: the Orange balm orange cap (Orange rose) Wang Prom. 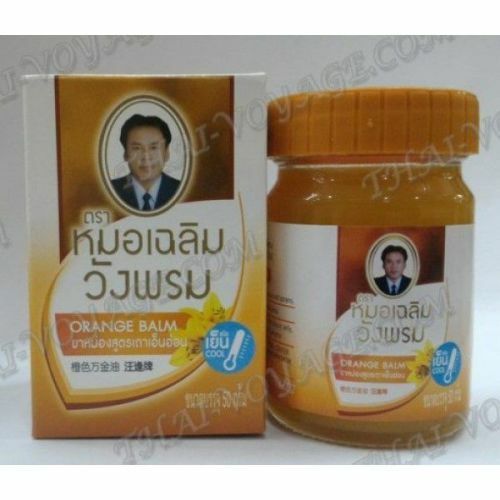 Orange balm is used for massage and to relieve muscle pain. Balm relieves nervous and muscular tension. Ingredients: Cryptolepis Buchanani 50%; Petroleum Jelly 20%; Paraffine 15%; Menthol 8%; Pogostemon Caslin 4%; Camphor 3%. 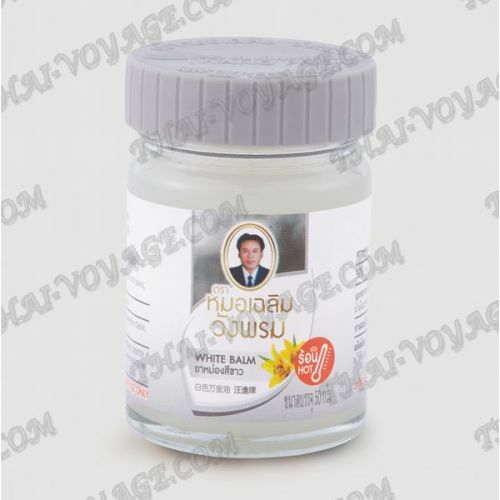 - Color grey: White Thai balm with gray cap (White Balm) Wang Prom. White balm soothes muscle pains, warms up. Ingredients: Gaultheria oil 57%; Menthol 22%; Pogostemon Caslin 11%; Camphor 10%. 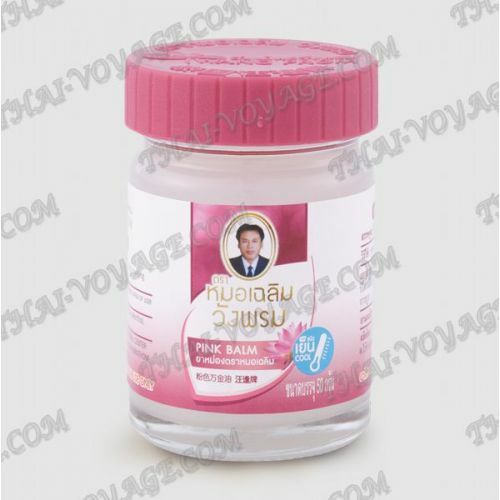 - Color pink: a White balm with the pink lid (Pink rose) Wang Prom. White balm reduces the symptoms of cold and dizziness, cool. Ingredients: Petroleum Jelly 60%; Paraffine 20%; Menthol 10%; Pogostemon Caslin 5%; Camphor 5%. Application: Apply the balm on the surface of the skin on the painful area with a thin layer and RUB a light massage several times a day. For external use only. For colds, RUB the balm in the chest, back, neck and nose before going to sleep. Avoid contact with eyes, mucous membranes and damaged skin.